Since I am now obsessed with spinning as well as with knitting, everything either looks like a knitting needle, or a spindle, lol. 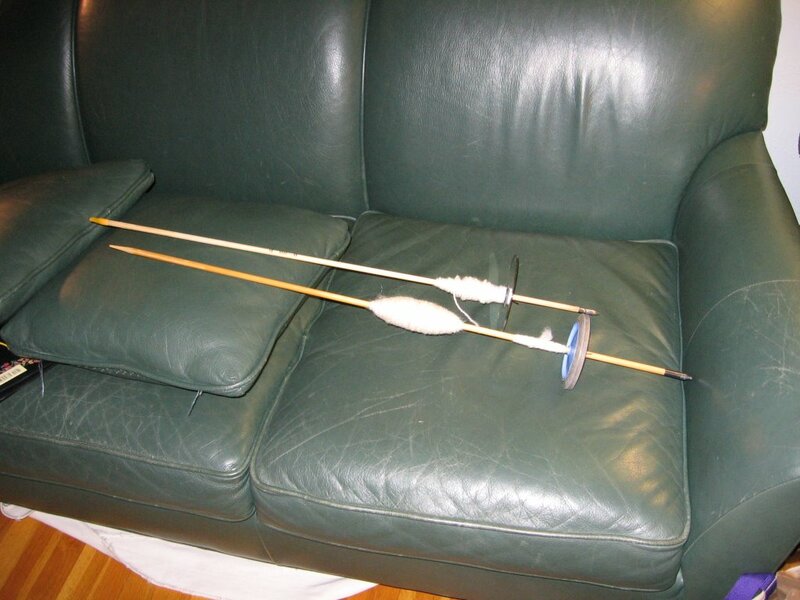 My son proudly presented me with these arrows, which had been abandoned at the local archery range, so that I could make knitting needles. Silly boy - couldn't he plainly see that these were actually spindles? The one on the top is made from an arrow and a CD, and the one on the bottom is made from an arrow and a baby-stroller wheel. 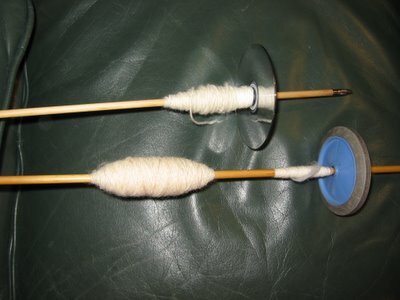 These are used in the Navajo method of spinning. The one on the bottom spins for an especially long time, as its shaft is perfectly straight, and the stroller wheel is rather heavy. On this one, I sharpened the end, but on the CD spindle, I left the nock in place, and it works just fine. On both, the metal arrow point is still present. I put the point into a bowl, and they spin and spin and spin..... I roll them up my leg, as demonstrated on this web page, Grafton Fibers. These are fun, but I'm fairly certain that I'm going to end up poking my eye out. While it was great fun to experiment, I think I'll stick with my smaller spindles, as there is much less chance of ocular damage. I think that these big spindles will be great for plying, however.